Tomatillos are a funny little fruit. They look like green tomatoes but come wrapped in a papery husk. Though they look like tomatoes, they have a very tangy taste. I guess I would describe the taste and texture as a hybrid of a tomato and a lime--heavy on the lime in terms of flavor and a lot like a tomato in terms of texture. Tomatillos are the basis of many green salsas. I find these days I am reaching for green salsa over traditional tomato based salsas. When I came across this Houston style green salsa I knew I had to try it. I discovered this green salsa through Secret Recipe Club. This month I was connected with Karen's blog, Cinnamon Freud. Isn't that a cool name for a blog? Even more so because Karen is a "counseling psychology doctoral student who loves food, cooking, and baking." Her blog was new to me and it was such a treat to browse all her delicious looking recipes. Karen has a nice mix of sweet and savory offerings. And for once in my life, I gravitated to the savory recipes. Once I saw the green salsa, my recipe for this month was a done deal. Hubby and I enjoyed this delicious salsa during Super Bowl, alongside homemade tortilla chips and carne asada. I've never been to Houston so I don't know what their green salsa tastes like. But according to Karen this is reminiscent of a salsa she ate many times at her favorite local restaurant. I loved it. It's got tang from the tomatillos and lime juice and a lush creaminess from the avocados. An awesome flavor combination. I topped it with a little cotija cheese to bring a little saltiness to the mix. All in all it was a hit! Bring a medium sauce pan of water to a boil (large enough to hold the tomatillos). Remove husks from tomatillos and boil 5 minutes until softened. Drain and set aside. Once cooled chop into quarters. In a small skillet heat olive oil and add onion and jalapeno and cook for about 5 minutes until soft. Add garlic and cook for an additional minute. Using a food processor or blender, blend tomatillos, onion, jalapeno, garlic and lime juice until smooth. Add avocado and cilantro and blend again until desired consistency is reached. Serve with homemade chips and garnish with cotija cheese. 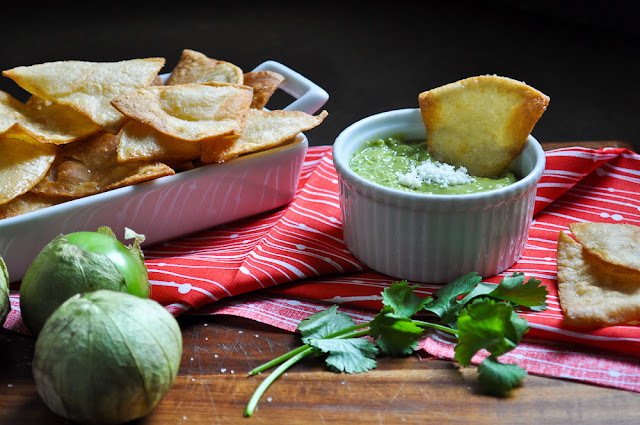 It's not easy to find tomatillos around us, but when we do, we'll be making this for sure! That looks very good! Your pictures are beautiful! Great pictures! 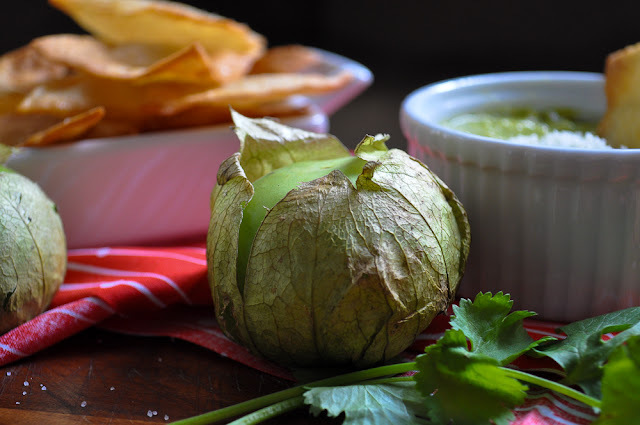 This sounds delicious, I love tomatillos! YUM! How about you come over right now and bring some. It looks sooo good with those chips. Love the tomatillos- very pretty and rustic looking. Your pics came out awesome, mama! This is going on the To-Do list. With homemade chips, you can't beat that. love the pictures and the recipe!! Being a native Houstonian, I was thrilled to come across this green sauce because it is a staple here! Yum! I've never had tomatillos before. They certainly look fun, and this salsa sounds delicious. Great SRC choice! We always have some of this salsa on hand! YUM! And gorgeous pics! This looks delicious--I'm all about salsa!! Definitely going on my must try list!! I wondered what it had in it to make it look creamy--never would have guessed avocados! Now that sounds GOOD! Oh and ps - your homemade tortilla chips look amazing, I want a big bowl of them! This sounds wonderful. I love green salsa, so I will have to try this. 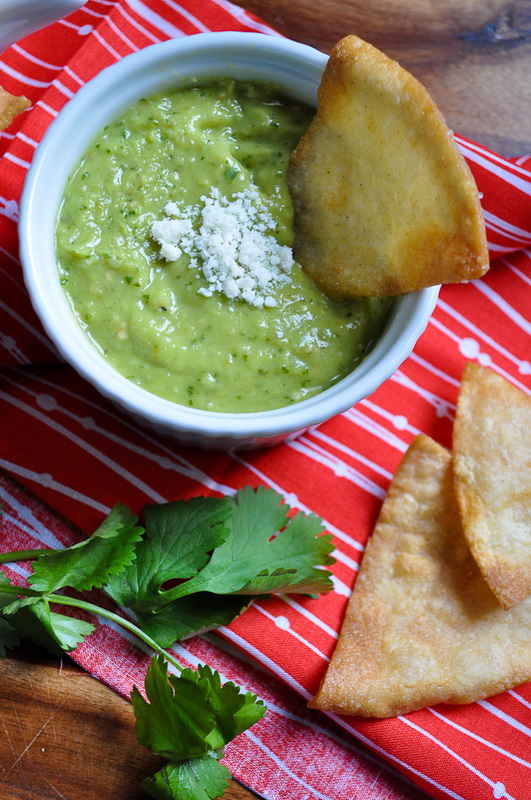 I love salsa AND guacamole - don't really see why this wouldn't be a perfect dip?! Looks delicious! Great SRC choice! So loving your dip - need to pin!!! What an awesome looking salsa!! Great colour and texture. Love those flavors, though I usually leave my green salsa chunky. Great recipe to share on SRC. the salsa looks delicious!! love the ingredients and your photo's are wonderful! Green salsa really is the best--it's perfect with halibut tacos! !